When I was in the fourth grade, I was told about an exciting club I could join called FIRST Lego League. At the time, I had no idea what FIRST was, let alone what FIRST Lego League was. I was told it was just building a Lego robot and running missions with a team of kids my age. I thought it would be nothing more than a way to pass time with some friends, but it ended up being so much more. FLL was the gateway to my current love for robotics and learning and teamwork. 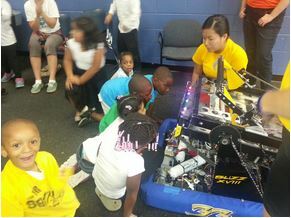 My experiences from FLL opened my eyes to the awesomeness that was right in front of me: FRC. The first time I had ever heard of FRC was at my first FLL competition. The Killer Bees came to my school’s mini-tournament. They were an amazing sight for a wide-eyed ten year old to see, completely decked out in bright yellow t-shirts while driving a giant metal machine around my cafeteria. I couldn’t believe high school kids had built that contraption, but I did know I wanted to be just like them when I grew up. That chance came my sixth grade year when my older brother joined the Killer Bees. I finally got insight into the “big-kid” robotics that was hopefully in my future. I went to every FRC competition the Killer Bees went to and spent my time either cheering for the Bees or checking out the pits. I knew once I was in high school, this is where I wanted to be. The competitions were even more energetic than the FLL ones and the matches were at a faster pace, keeping me hooked the entire day. Every single Killer Bee I saw had a huge smile on their face. I could tell how thrilled they were to see their hard work finally put into action. Over the next few years, I kept up with my FLL team. I attended an FLL summer camp run by the Killer Bees and then tried to stay focused as my eighth grade year came to an exciting end. Before I knew it, I was applying to Notre Dame Prep, always adding robotics to my extracurricular interests. When the time finally came to join the Killer Bees, I was proud to have a few years of FLL to back me up. Without FLL in elementary and middle school, I don’t know where I’d be today. I’d like to think I would have found the Killer Bees in all of their glory anyway, but FLL definitely fueled that fire. Part of what makes the Killer Bees so successful is the team structure. Through the recruitment, “minions” system, and student leadership, the Killer Bees have proven their sustainability. These students work together to build specific components of the robot. Multiple mentors with years of engineering experience work with the students to teach them how to apply math to the robot. But the mentors don’t get to have all the fun. The students are the ones in really charge. Experienced students get the privilege to pick and choose less experienced student “minions” to help them. The “masters” get to teach and learn alongside the new Bees. Two heads are better than one, and six heads are even better. With everyone working together, the robot slowly comes together piece by piece. The BATMAN group ( Business and Technology, Marketing and Networking), is essentially the everything-but-the-robot team. They work on computers rather than a drill press, but are important to the team nevertheless. They handle award submissions, website content, documentation, outreach, and more. Just like the shop Bees, these Bees work together to finish essays and take pictures to meet deadlines and document the team’s service and competitions through the years. Last but not least, the mentors are the backbone of the team. As high school students, we can’t run a full team all by ourselves. Although student leadership is a major part of being a Killer Bee, the mentors are there to keep us in line and, of course, teach us what we need to know to be successful in FIRST and out in the real world. They go out of their ways to dedicate time and effort into this team and the students on it. Any member of robotics can tell you that mentors are absolutely essential to every FRC team, but the incredible value of student leaders often goes unappreciated. The Killer Bees are fortunate to have many upperclassmen who both take on the responsibility of dedicating themselves to building the robot and also help in teaching underclassmen. Our team is structured uniquely because no one person is designated to be a team leader. This is done in order to encourage any student to show leadership and guide their peers. Thankfully, a number of students have successfully risen to the challenge. Many student leaders still rely on mentors for guidance and instruction, but they have been able to explore their newfound leadership by leading sub-groups of underclassmen. Naturally, at first some students struggled with the process of sharing the work in order to teach others, but eventually all became able to both manage a team and get work done. Having upperclassman teach underclassman is beneficial to all involved because it not only teaches the younger students about engineering but also teaches upperclassmen about leadership. I have also personally experienced how valuable student leaders are to the team. My freshman year I joined the Killer Bees with almost no technical or mechanical skills; however I consider myself especially fortunate to be on the team with so many people who worked hard to educate and help me. I remember that Ellen, now our senior driver, was the first to teach me how to properly bolt two pieces of metal together, and has taught me so much since. I can’t even begin to list all of the things she has helped me with. Ellen continuously works with everyone to patiently explain new topics and is a great role model through her hardworking attitude. Emily, a current senior, was the first person to show me how to use the drill press and sander when I first arrived on the team. At first I was timid around her, but I soon found that her skill with tools was matched only by her enthusiasm and friendliness. Any time I work with Emily she is able to explain concepts in a way that is easy for me to understand. Being taught by other students is one of the best ways to learn because they also remember how complicated new things can be and explain things in a way that makes sense. Upperclassmen educating and helping underclassmen like me is just one of the many things that make me absolutely love being a Killer Bee. Throughout the years, the Killer Bee students have gone out of their ways to help other teams, especially FIRST Lego League and FIRST Tech Challenge Teams. The Killer Bees have created mock-tournaments and have also been judges at real tournaments. The Bees spread their love of learning and working with other people to members of younger teams to inspire them to continue with the FIRST experience. This past season, two Killer Bees mentored and refereed for these teams. Perry, a sophomore, jumped on the bandwagon to help a struggling FLL team. With little done just a few weeks to go before their first competition, Perry helped them to enhance and program their robot. This was a challenge for both Perry and the younger students he was mentoring. He learned how to program the new EV3 hand-in-hand with the FLL members. Perry said it was a “good experience” working and learning with them. He adopted similar methods of teaching for his students as the FRC mentors used during the FRC build season. Instead of teaching at the students, he taught them what they needed to know but let them experience and understand it in their own way. By the time the competitions started, the team had a robust robot that they were proud of. They took home awards at every event they attended, including awards for the robot and core values. The season ended with a very proud team who not only learned how to make an award-winning robot, but also had an amazing education and story to go along with it. Perry also supported a FTC team this year. As it was the first year for both the team and Perry, it was definitely a learning experience on both ends. According to him, it was a “complicated” process and harder to understand than he expected, but Perry and the team worked hard to make their robot the best that they could. Perry discovered that the best way to get the best robot possible in the limited amount of time was to complete the task at hand, then go back and fix, tune, and touch up after. This approach worked and the team did extremely well, including a huge range of scoring positions in autonomous mode as well as a good-looking robot on top of it all. Even after the robot was built, Perry continued to teach the FTC members. He taught them what to look for to scout other teams in both the pits and during matches, both techniques used on the Killer Bees. The team took all of these skills to their competitions and even took home first place at the regional tournament. Although the training was long and hard, the season ended in the best way possible. Both the mentors and students took a lot away. Not only did they have to completely learn how to create and run a FTC team and robot, but also how to work together to be the best team they could be. Another student, a freshman Christopher, refereed a FLL tournament. He got to see how each team approached the challenges differently. He said it was interesting that each individual team and student created a completely unique way to solve the problems at hand. Each team had their own thought process and way to handle what was given to them and it was evident in their final product at the competition. No two teams were exactly alike, which is what makes FIRST so special. The Killer Bees have learned so much during their FIRST seasons and love to share that passion of knowledge and creation with the up-and-coming members of the FIRST community. Going out into the world and getting involved with other people not only opens their minds, but the mentors’ minds as well. Honestly, everyone knows that sometime in the future they’re going to be living in their awesome penthouse, some 500 stories up, waiting for their robot servant to bring them their Canapés. It would be named something like the Deliver Master XVI. Now, even though the Deliver Master is there waiting on you, someone had to make it, design it, and work out its kinks… Right? Well, those people were probably FIRST alumni. Let me give you a look into the asylum of the Killer Bees.